I started my healthy eating 10 years ago, I retired 11 years ago because I was sick of the problems in teaching. But at the same time my health was not good, and my life was limited – going to work, going home and resting, and enjoying teacher holidays. I had stomach and sleeping issues which I put down to stress. When I retired there was no stress, yet the issues mainly reflux and migraines remained. After a bad time I happened to be going to Bangkok, and happened to pass a clinic that turned out to be a natural health clinic. I went in and the doctor said diet. When I examined what he had asked me to do, and the diets that I saw on the internet, I got drawn to mb. Over the next 5/6 years my health gradually improved, and I felt good – reflux and migraines gone. 7 years was an important time as that is when the body is supposed to have renewed itself – being toxin free. But at 5/6 years it started to go wrong. I remember speaking to you about hormones and andropause. I had a cold chest in Thailand which was weird. A year ago reflux returned, and last February I had a minor incident concerning my heart. NOT a heart attack. I was swimming as usual, and there was a wind – to amuse you 300C and a cooling sea breeze!! I began to feel weak, I got in the car to go home, didn’t feel so good all the way home. Here is the fortuitous part. I have no access to the various supposedly-alternative medical practitioners there are in the West. There are two sources of natural healing here – TTM (Thai Tradional medicine – Thai herbs and massage) and TCM (acupuncture and Chinese herbs). I had been to see a Thai herbal doctor who had helped but not significantly. A newly-qualified Trat resident had started a TCM practice – she looked so young I call her Mor Nakrian (Doctor Student). She has treated me off and on for four years so when the reflux started last November I went to her and she made it better quickly. But I had been putting on weight, it was concerning me. Instead of being between 80-85kg I had reached 95kg. Weight and hormones meant a metabolism issue, and so she was treating me for that when the heart thing happened. In April she asked me to have a blood test which gave me results that said you’re going for a heart attack – high triglycerides and low HDL cholesterol just inside the limit. She started treating me for this. I reduced my swimming, but walked and did chi gung. She moaned a lot about wind. I have acclimatised so much that the seasonal changes were doing me in. I became conscious of the affect the aircon was having on me. The heart thing meant my extremities were suffering so I was wearing wooly hats socks and using a blanket with the aircon. Old Thai man style. After 6 months of acupuncture I was feeling good and asked her why I was still coming. So she sent me for another blood test and the numbers were slightly worse. I felt good but was still a heart attack waiting to happen. Here is where I am getting to the point – sorry!! She said triglycerides means diet. In suitable arrogant fashion I said that my diet was better than hers!! Her assistant sat down with me and got out a yin-yang chart, and I realised. I know I haven’t followed the yin-yang part of mb, so when she was telling me yin-yang it came home to me. In acupuncture terms all the things that have happened to me have been yin excess. In my 20s I had my first visit to acupuncture and she told me that my headaches were yang excess. It was about that time I became vegetarian, and have been vegetarian most of my life. I was in Africa 6 years in my 40s, and there didn’t seem sufficient veg to risk it so I ate meat becoming vegetarian again when I left Africa at 48. My first real health issue came three years later, and I now see it as hormones and andropause; I couldn’t sleep. I changed jobs and somehow sleep sorted itself out mostly but I developed the stomach I associated with stress. And then the rest as I described above. I know it is toxic but they made me eat meat, and I feel better for it. It has been two months so I should wait to draw my conclusions. But I feel that my mostly plant-based diet was putting me at risk. The other night I watched this talk by Michael Greger. He describes statistics that show many weaknesses about a plant-based diet but within the context of plant-based he attempts solutions. He does not discuss yin-yang but meat balances yin-yang even though it is extreme. The nub of what I am saying is that over the years I have increasingly “yinned” my system. I was lucky to be seeing an acupuncturist who only sees in terms of yin and yang so rather than supporting the healthy practice of a non-processed diet she saw dangers because of my health conditions and the lack of yin-yang balance. Now my plant-based diet has more fish than is mb, and definitely more than vegan. Now I met you through vegan. I am sure the extremes of my diet don’t appeal to you but at least it is yin-yang. Before it was not and I was developing yin excess syndromes, flus, hormones, digestion, sleep, metabolism, cold chest and weak heart. I should note that the yin excess conditions were disguised by my ageing, and was put down to my getting older. I have ignored age-change approaches and returned to “more swimming”. I have no idea whether the plant-based approach produces yin excesses in everyone – although logic tells me it would. But I see this as a warning. The toxins in meat seriously worry me but my toxic balance is good so maybe I can cope. It struck me this morning (hence why I am writing this), maybe I am being melodramatic but was my healthy diet killing me? If you follow macrobiotics you will notice something missing. Over a period of 6 years I personally went through these stages, and my health greatly improved – I was flying. I had told cells recreate themselves in 7 years and I was hoping for a kind of peak. Then it went wrong. After 6 years I developed hormone problems, I had repeated flus and a seriously cold chest – a Farang wearing fleece in Thailand. I tried to redress that with cheese, and after a stop-start this eventually led to reflux towards the end of last year. This year I had a serious incident leading me to check my blood which had high triglyrcerides. I got treatment from an acupuncturist and felt great, repeated the blood test and the triglycerides. The acupuncturist said triglycerides is diet, and somewhat arrogantly I said my diet was better than hers. I had focussed on diet was doing all that I could but my triglycerides were high. She said my system was yin, I had been told that 4 years earlier with the hormone problem. But I had given up putting it all down to ageing. Here is where the sound mb people will tell me what is going on, I was not balancing my diet. In following my mb diet I had made no effort to make my diet yin-yang. 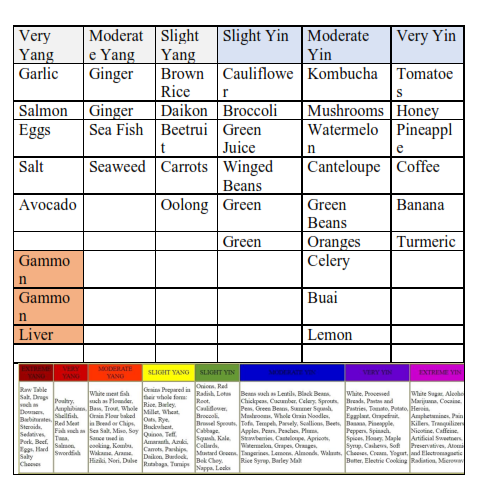 As a result my detox diet was predominantly yin, and this was reflected in my yin conditions which included the heart, digestion and hormone problems. using Greg Samples yinyang table (I had an excellent dialogue with Greg online one time that made me respect some libertarianism but not now with Trump). This was so yin-skewed I was not surprised that my condition was yin. So I needed yang and I looked, Greg, and I couldn’t do it. So I am eating meat every two days – gammon steaks and liver, my acupuncturist said I should add a little Muu (pig’s meat). My body feels better in a week but I am not banking on that – I could easily be deluding myself. 6 months for the next blood test to see. There are a few ironies in this, high triglycerides means low carbs – more yin. To balance the yin with yang I am eating red meat which is not at all recommended for heart conditions. To improve my health I am eating food with toxins. I was so completely aware of how toxic my body had become that it took a lot to consider eating toxins. I intend spending time looking for non-toxic meat but I hold out little hope here – especially not gammon and liver. Disappointing day today. I have been feeling much better after a relatively difficult year; for someone who doesn’t know me I am highly critical of my health self, problems I have always seek to optimise rather than looking for cure to bad illness – probably if I was seriously ill I wouldn’t say anything. This time last year I had trouble with reflux because I had let cheese creep in. Whilst still treating the reflux problem on 14 Feb I had heart issue which worried me. I had test numbers with high Triglycerides and low HDL. I have continued metabolism treatment and treatment for heart, and have been feeling much better – feeling good. And the swimming was back up. I asked Dr Nakrian why I was having treatment, and she had missed a 6-month retest deadline she had in her mind. I did the test again, triglycerides the same HDL lower. I checked this page – 9 things to raise HDL, and almost all 9 (except the obvious) I don’t do. I look at diet and it says low carb diet. Whilst I am eating cheewajit it is high carbs and fish – because I am lazy. Now it must be low carbs and fish, soup low carbs and fish. I got lazy with greens, change the way I cook – go back to steaming veg. Steam veg, glass bowl oven fish and olive oil fry aubergines, eggs, mushrooms and tomatoes – low heat. Change soup:- green juice base, tomatoes garlic mushrooms, rice carrots and beetruit only high carb – and hoi. Here are pikkies. I should know if I am thinking lazy cooking, I am thinking unhealthy cooking. Eat coconut oil every day. Purple – aubergines and berries blueberries, blackberries. Maybe those berry fruit shots will help. I just looked at Glycemic load written after the last test. I am eating all the fruits to avoid and potatoes!!! I should read my own blogs especially as no-one else reads them. What a fool! Since the beginning of November I have been suffering with digestion issues, and I finally tried to resolve them with acupuncture. Immediately the worst aspects of reflux and the “fullness-feeling” that was giving me sleep problems disappeared. Well almost! Late night last Saturday I snacked on a cheese sandwich, and reflux came; so in the middle of the night I chucked out some lovely cheese!! Following this, last night after butter on my sandwich at 8.00pm I had an uncomfortable feeling in my stomach – almost reflux; so, middle of the night again, butter also hit the bin. I don’t drink milk but attribute these refluxes to a lactose intolerance based on old age and based on my system being better attuned with the acupuncture and recognising that dairy is not good for it. This is my lactose intolerance. However I have found some nice bread – gaba rice bread that has not given me the wheat problems – other wholemeal breads I have given me problems recently. Now I need butter – vegan butter, something to spread on the bread so that it is not dry. Sesame seems a good start but tahini is dry. 2) Once roasted sufficiently, they can be ground in the grinder – fill the grinder. 3) Once ground, in the blender mix with 1/2 cup of sesame oil. 4) Now mix in honey to taste, and blend. Just made this, can use it instead of butter. NOT too dry. A creamy almond butter that’s more affordable than the store-bought versions! I found almond flakes so will try those. 1. Place the almonds in a food processor fitted with an “S” blade. Secure the lid and allow to process for 20-30 minutes, stopping and scraping down the sides as needed throughout the process. 2. The almond butter is ready with the oils have released and the resulting butter is very smooth and creamy– this takes more time than you’d expect, so be patient! 3. Transfer the almond butter to a sealed glass jar, and store in the fridge for best shelf life. Place oil, salt, and seasoning in food processor and process until oil is soft and creamy. Add peeled and pitted avocado and lime juice. Process until smooth and oil is thoroughly combined with avocado. If your avocado is cold, bring to room temperature before using, otherwise it won’t mix with the oils well. It is interesting that this lactose intolerance has appeared after a lifetime of eating too much cheese. During my adult life I have been an avid butter and cheese eater, a number of times I was vegetarian and my main protein was cheese – a typical lazy meal was boiled veg with a lump of cheese, and I often made cheese pasta dishes. In Thailand vegetarian is usually translated as gin jer, but Thai vegetarian restaurants (gin jer) don’t have dairy, in fact I believe Thais think eating cheese is like meat-eating. So gin jer is vegan. Cheewajit (and macrobiotices) don’t eat dairy, and I was just giving in to taste in eating it. And suffering as a consequence. Here is John McDougall on food for cows rather than humans – NOT for this human now. I think I am coming through a series of digestion issues. I started my diet because I had been getting repeated reflux and headaches, both of which I thought were caused by stress in work – yet I had been retired a year; many times I thought the headaches were caused by stress giving me digestion problems. Soon after the diet started the reflux went, and over a period of time my health steadily improved with the diet and improvements in diet I steadily made. Three years ago things levelled off, and then started to worsen. I discovered a chronic lung problem – that was giving me repeated flus, and was treated by an acupuncturist for this. I still have weaker lungs because of my age, but keeping them warm stops the repeated flus – an OK balance. With my digestion I became frustrated because I put on weight. I had reduced to 85kg with diet but went back up to 90 and couldn’t do anything about it; during this digestion problem my weight reached 93 kg. I started eating butter and cheese because I liked them – I overdid it and ate too much. And last November I came down with reflux again – as discussed in my last blog I vastly cut back the butter and cheese, and took sodium bicarbonate. The reflux went but I was still struggling with digestion – feeling full and when I lay down to sleep felt that stuff wanted to come back up. I propped up the bed and slept with my head well elevated. The sodium bicarbonate was the first mistake. I had read to be afraid of it, and when I first tried for a pH balance had used it and not felt good. This time I felt OK and the reflux went so I made my own alkaline water with this sodium bicarbonate. My digestion got worse as I felt fuller and fuller and felt this fullness when I went to sleep. In the end I stopped the sodium bicarbonate because I felt it was neutralising the stomach acids so my food was not being broken down in the stomach and staying there. I still feel that – without any proof. But even though I stopped the sodium bicarbonate I found that I hadn’t resolved the problem. Following the reflux last November I had changed back to a 50% raw diet, I was convinced that was the right way to go. I had never been good on breakfast so this felt good when I started it. But I could not resolve the digestion issue despite improving my diet – or so I thought. So yesterday I visited the acupuncturist who had helped my lungs. She listened whilst I went into more detail than she needed – especially long and difficult as she was Thai and I was speaking broken Thai. She immediately honed in on the raw food and the digestive cycles. 20% raw, and breakfast – rice soup. She gave me treatment, some pre-food medicine, and said two or three treatments. After the treatment she thought one would be OK, and things are much better today. To be fair to raw people I have always read that older people (I am 64) should be careful with raw. I am still concerned about the weight. Older people get fatter but I don’t want that. Having the extra rice soup can’t help with weight, and equally reduction in raw food cannot be good for the weight. But at the moment the sleep-related digestion issues appear on the way out. The state of my health greatly disappoints me, it is still good but a disappointment. 9 years ago I began my cheewajit diet with tremendous results. I went to a natural health clinic with migraine and reflux problems, and the clinic immediately told me I had GERD and to do the diet. With the cheewajit my weight dropped to 85 kg – BMI 80kg, and I began feeling good because of the diet. I was JimCarrey-esque with my elation over the benefits of healthy eating. About 4 years ago things changed. I began experiencing regular flus that were a combination of hormone issues – andropause, and a lung condition. Over the last two years my weight has increased to 90 kg although it seems to be stable at that. Because I was unable to get my weight down, I gave up a little and began eating butter and cheese. I have always liked cheese, and even when my diet was going well I ate the occasional pizza with no problems. I started with the butter and cheese 3 years ago, and stopped because of adverse effects. Two months ago I started with the butter and cheese again, and developed reflux problems again. When I was teaching sleep became a problem. It began with stress, and I would recognise the source of the lack of sleep through the swirling mind-chatter. In later years I was meditating and sleep was better but in the end I lost sleep yet the mind was still. When I was eating cheese three years ago I also had a sleep problem, and didn’t really come to terms with it. Good sleep is a measure of good mind, energy and body routines – eating well, doing chi gung and meditating. However I negate that because in retirement I prefer staying up late. I know sleeping between 11.00 pm and 2 am is good for your health – I call them melatonin hours, and often I have no melatonin hours. This is not sensible. But I have now determined the source of the sleep problem that occurred during later teaching and since – GERD. Obviously if I have the reflux then I am not going to sleep, but when my digestion system was in a mess I can see that as being a source of the lack of sleep. Recently, both three years ago and now, I will go to bed late and tired. I would lie down and my mind would start thinking – not chattering but thinking. I associated it with not enough study and writing to begin with, but it happened when I was doing both. The problem was GERD, not the actual reflux coming into the mouth but the unsettled digestive system. Maybe I had experienced some reflux during the night and the body was not happy with this. Once I began to realise it was the re-emergence of reflux, I angled my bed; now my head is raised sufficiently that the reflux will not happen with gravity. But that is only the beginning. When I first thought digestion was an issue, I considered pH balance. For three or so weeks I have been using lemon water knowing that has an alkalising effect. I now also think the citric contributed to reflux. But I haven’t given up with alkaline water as I make water with baking soda in it. I still have to work out a balance between the alkaline water and normal water for my water intake. Previously I have used a turmeric-plus drink, and I let this drop. The drink in brown-rice milk, two spoons of ACV, 2 teaspoons of turmeric and a bit of black pepper, honey to taste, and sometimes chia seeds, garlic or ginger. I started this again and it helped. I now want to make two of these my daily routine. I like cheese, and I think I can bring it back into my eating but it has to be controlled – I don’t know how well I can do that as I have cheese cravings. What disappoints me about all of this is that it is never a solved problem. Diet helped and I felt Carrey-esque good. I even thought it was the end of health problems. Four years ago when health issues returned I was annoyed – now I am 64. The lung problem is permanent – it is ageing in me. GERD is also an ageing problem. When the reflux stopped, I would occasionally feel GERD stuff but not reflux. That seemed to go but it hasn’t. I have no choice, I have to be constantly vigilant of it. Health awareness, that is the point of this return of reflux. Decisions I made concerning my diet are not set in stone, nor am I in a Carrey state where health will always be with me. My body ages. It has suffered damage in life, both naturally, by genetic inheritance and by poor treatment. This cannot be ignored. Living with my health is a matter of constant questioning, and carrying out routines. I have probiotics back – kimchee and kombucha tea, I felt good about that. I also mentioned the turmeric milk routine – I felt good about routines. But then reflux. There has to be constant health awareness. Apart from questioning eating routines there is the meditation, chi gung and physical exercise. As I get older I see these as being daily requirements – certainly meditation and chi gung; the meditation should be twice daily for spiritual reasons. I sometimes feel weak, and give up on these in part. That cannot be – constant awareness of mind, energy and body is essential. This morning has been difficult health-wise yet I feel very positive. I have recent issues – constant overweight of 90kg, cold chest and stomach, and I am hoping these will be resolved from what I have worked out. This morning I began the parasite purge, and just one time with the brown rice I had a deep reaction convincing me of the presence of parasites. There were reactions in my stomach and my breathing was heavy. This suggests to me that my lungs and stomach issue is related to parasites and not just a weakening in old age, and my overweight might be parasitic-related. Here in Thailand water is difficult for westerners. There is not the level of water treatment that there is in the West (too much in the West needing a flter). Even tourists know not to drink the tapwater but that is not the issue for me. I live in rural Thailand, and not all the water sources are mains. I have just moved and that alerted me to the possible problem. They call it nam bor, what might be loosely translated as water treated from a borehole. A Thai friend described this water as better, but I feel that Thai people have a stronger immunity to their water issues than I do. I use a water filtration system that gives high pH, and I used it with this nam bor. I was not sure of the results. It has happened before – 4 years ago. When I last lived off the mains-treated water, the water with my filtration system made me ill. I started drinking bottled water then, and felt better. I am not confident with the water in my new house and have started using bottled water. I have used the parasite purge twice. Once when I first started cheewajit nearly 10 years ago, and once a few years later. I felt better after both. I made a mistake. When I realised that the rural water was not good I should have done a parasite purge so it is possible I have been fighting parasites for 4 years, now I have issues with the water again I am doing the purge. And I had an immediate response. There is another issue with my water at home, I bathe in the treated water; can parasites enter the body whilst showering? On top of this my exercise is swimming in the sea, what parasites am I subject to there? And then there are my beach dogs. Therefore I must do an annual parasite purge. So what is the purge? 1)	¼ cup of raw brown rice in the morning. Because my teeth are shot I rinse and grind the rice the night before. Chew the rice until it is pulp, and swallow. Wait three hours before eating. Do this for 7 days, break for 3, do again for 7 days. 2)	Teaspoon of ACV (Apple Cider Vinegar) before eating. 3)	Clove of garlic between meals. 4)	Sauerkraut or kimchi to replenish the gut bacteria. Tablespoon every meal. I am slack with fermented foods despite this blog recognising their importance. I have kombucha tea on the go at the moment but I am not sure whether my scoby remains are good enough. I have plain yoghurt but am not sure of how good that is. And I don’t use sauerkraut or kimchi anywhere near enough. I hope I will persevere with the fermented stuff. But the main point of this blog is the Parasite Purge itself. My thanks as always to Paul Pitchford with his health bible “Healing though Whole Foods” – Parasite Purge discussed App A pp 654-666. I resolve now to do the purge annually, will I? and decided to try it – plenty of cinnamon and honey here in Thailand. 1. Dissolve a teaspoon of cinnamon powder (or ground cinnamon) in a cup of boiling water. 2. Stir and cover for half an hour. 3. Filter away any big particles and add a teaspoon of honey. and have come up with a delicious spread for bread or toast. Well pleased. 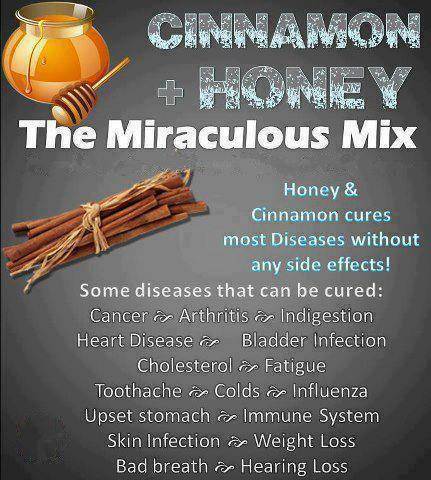 Cinnamon and honey is apparently an Ayurvedic medicine. Benefits are written here. I picked up on this from Gee online because I think turmeric is the business; I regularly recommend it to people to help their liver work against the toxins. The last time I recommended it she said she wouldn’t take it in water because she didn’t like the taste – I half agreed the taste in water is not good but I still drank it. Now I don’t have to because I have seen this Jamu Kunyit. Not only is the turmeric palatable but you also get the health benefits of tamarind. Here is the recipe that Gee gave, this is way too messy for me but healthier. I amended it because I want to drink the stuff everyday. This website is about eating healthily in Thailand so the ingredients are Thai-specific. The drink is mixed in a blender and the makham rolls have seeds, so you need to get juice from the makham rolls first. I have this on the go all the time. Get a bowl, put the rolls in the bowl and cover with water at least half inch above the makham. Leave to soak for a day. Wring the rolls with your hands so that they break up into small pieces, then pour the mixture through a cullendar and put the juice in a blender. Put the pulp and stones into the bowl and cover with water again. This time with palms together rub the pulp and stones together trying to separate as much of the pulp from the stones – still in the water. This means that you can get more of the makham in the juice. Do this as often as you feel – even just once, and when you are ready pour it through the cullender again. Pour the juice into the same blender and then you are ready for the other ingredients. Throw away the remaining pulp and stones – some of the healthiest stuff! These next three must have to be used specific to your taste, so you will have to learn over time. I put in 2 heaped teaspoons of turmeric but you have to be careful how much turmeric as it can dominate. Then you add the honey and lemon to taste – you could start with 2 dessertspoons of each. All are now in the blender, you can add water if you want to fill the blender. Blend. Bottle the juice and put in the fridge. I drink mine within 2 days – I don’t know how long it will last in the fridge. Next time I will add flax seed, a teaspoonful will not affect the taste and it will enable me to regularly take flax seed!! I have taken to call this juice “yellow juice”, so that I have yellow juice and green juice morning and evening. In Thailand they call it yaa rabaii or something like that. I mentioned yellow juice to a friend and she turned her nose up at it – yaa means medicine and she used it for constipation. Whatever she says I think yellow juice is delicious.